Abu Dhabi: Etihad Rail, the developer and operator of the UAE’s national railway network, has launched this week a multi-faceted campaign that will educate and urge communities to follow safety rules along the path of the network. The safety campaign is a critical component of Etihad Rail’s preparations for launching full operations, which will see trains running for the first time in the UAE and will run throughout the Western Region of Abu Dhabi. A key part of the safety campaign is a roadshow that will tour the Western Region over a seven-month period. 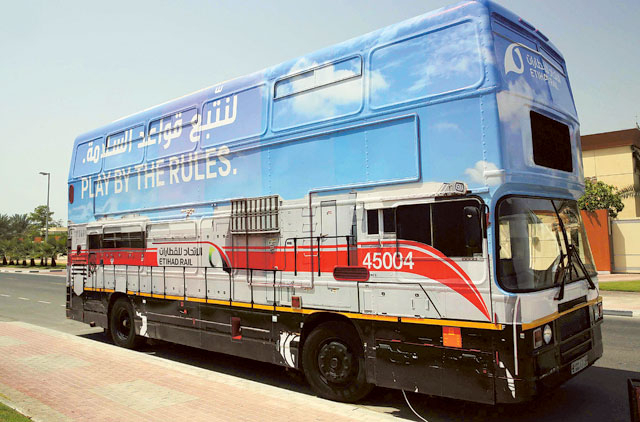 Stopping at schools, municipality buildings, malls, workers’ accommodation and other community areas, the double decker roadshow bus has been designed to resemble a train and features an Experience Centre that will engage the audience on how the railway will work and how it will impact the UAE. Additionally, members of the public will learn essential but simple safety tips to keep in mind while around the railway lines. These tips include staying outside fenced off areas around the tracks, crossing only at designated areas, and reporting damaged fences or people breaking the rules by calling 02 4999 889. Campaign organisers will also distribute flyers in Arabic, English, and Hindi to alert communities about the approaching historic launch of the Habshan-Ruwais route, carrying the slogan, ‘The Train is Approaching… Play by the Rules’. The railway’s tracks are fenced off to allow trains to travel safely around the network. People can conveniently cross using 20 overhead bridges, two underbridges, 10 road underpasses and 18 smaller underpasses for future use. Animals will also be able to move around their environment via the 10 camel underpasses, 22 gazelle underpasses, and 78 reptile underpasses.